Perhaps the most classic story of the Jewish people is our journey from Egypt to the Promised Land. For many of us as individuals, we travel on a similar path to that of the ancient Israelites, spending much of our time wandering through the wilderness, seeking to find a Promised Land. I knew I wanted to be a rabbi. A product of the Reform movement, my family belonged to a Reform congregation in the north suburbs of Chicago, and I was privileged to participate in many aspects of the congregation even at a young age, which only enhanced the Reform Jewish life I experienced at Olin-Sang-Ruby Union Institute, the URJ’s regional camp in Wisconsin, where I spent seventeen summers fully integrated into that community, as camper, counselor, unit head and more. or college students, whose zest for life is magnetic. I feel enlightened every time I study, celebrate with or comfort empty nesters, who have many choices in life, and choose to spend time in the synagogue, embracing Judaism. I feel blessed when I meet with seniors and I have the privilege of hearing their story and learning through their lens of life. 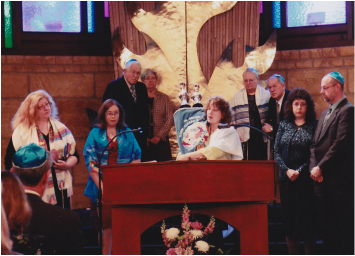 Throughout my rabbinate, I have had the opportunity to serve a very small congregation to one of the largest congregations in our movement. I have served congregations with large budgets and small budgets. I now understand that success as a rabbi is not about the size of the congregation I serve. Rather, it is about the people with whom I relate and the intimacy we can foster as we come to know one another. My experience with diverse congregations has clarified for me the real beauty and holiness of the work I am privileged to do each and every day of my life. I have been able to dig deep into my soul, to search for creativity and passion, to find ways to help connect my congregants to what I believe is a path toward the Promised Land. I have opened my eyes to the very important notion of K’lal Yisrael (the greater community of Israel), and the significance of working hand in hand with our non-Jewish brothers and sisters. I recognize now more than ever that each of us travels a different journey to reach our own version of the Promised Land. And yet, there are so many similarities as we wander through the wilderness. Most of us are trying to make some sense of tzedakah, either understood as charity, helping others, or even literally as reaching for a more just and righteous place. Many of us are trying to become better educated, hopefully finding ways to embrace Torah and make it a part of our daily experience. Some of us are even trying to find a place and a way to understand God in the good and bad that occurs to us and to our world every day. For me, my embrace of and love for the State of Israel, our homeland, is a passion and a relationship that never falters, and enhances every moment of my life. When I travel to Israel with congregants, especially when I have the good fortune to introduce them to Israel for the very first time, I am flooded with emotion with every step we take, yearning to share my love and connection to Israel with my students and congregants, who often become my teachers and friends. Throughout my rabbinate, I have embraced fully the idea of relational Judaism, and just as I discussed in my rabbinic thesis many years ago, I continually acknowledge the significance of building relationships with congregants and students, one person at a time. As I have opened my home throughout the past several years, welcoming hundreds of congregants of all ages to share Shabbat, holidays, meals and more around our dining room table, in our sukkah and under the stars for havdalah, I have come to realize how important it is for me to model and share the excitement of Judaism, and then it becomes contagious. On my ever-changing journey through the wilderness, I have certainly clarified many aspects of Judaism for myself, and I have come to realize the importance of two essential aspects of Judaism: a true Jewish home and family, and the influence of prayer and worship. Much of my recent years in the rabbinate has embraced worship, music and the importance of making prayer tangible for all those who seek its support, and even for those who do not. As I continue to grow as a rabbi and as a woman, it is through worship that I see my greatest challenges, and my holiest moments. I have also begun to recognize the importance of Jewish home life, and that rabbis and Jewish leaders need to be models and teachers of Jewish life and custom by example. Perhaps the greatest gift I give to those around me is the enthusiasm I bring for the sheer delight of and relationship with Judaism, with Torah and with God, just as the greatest gift I gain from those at my side is the substantial way I have grown through each and every interaction with members and non-members, Jews and non-Jews, learners and seekers, elders and babies. On my journey, I have made thousands of connections with people, and each one has made me a better Jew, a better rabbi, and most importantly, a better person. As I look to the future, I hope to create and enhance relationships with individuals and families, through the community and by bringing people into my home.